I like your version too, but it doesn't have all the information that the previous chart does, right? For instance, I think yours doesn't convey that although the unaffiliated group doubles in size, about half the people who started out as unaffiliated left for various religions. I thought that was an interesting point too. I'd go for a spot matrix, which is a sort of heat map, but with circles or squares of varying sizes instead of cells of varying hues. By the way, I think there's a missing strip in the flow diagram. There should be a blue strip from "Black Protestant" to "None". Your web-of-debt-styled chart is simpler, and I think oversimplified. You show only the net percentage change in the groups, but not all of the movement, and we have lost the relative sizes of the groups. The original chart wasn't bad, though some less glaring colors would have been nice. Thanks for the comments. 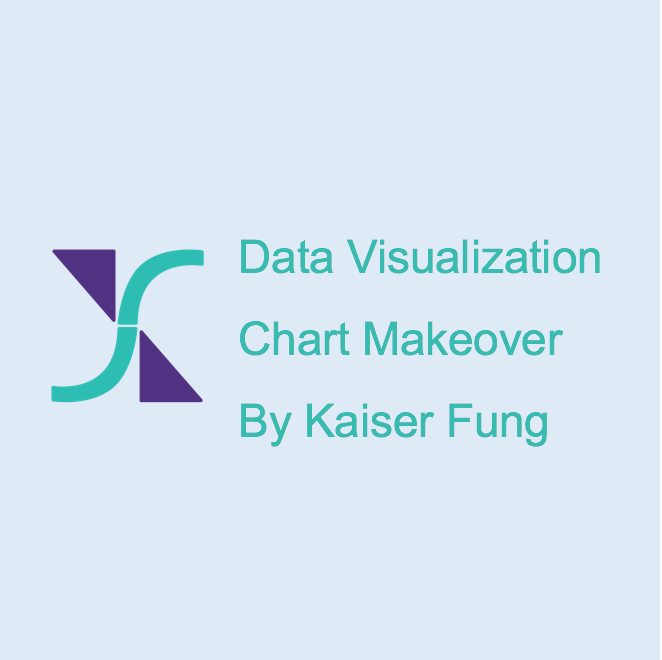 My philosophy has always been that one should not attempt to load up charts with data but rather figure out what the data is saying, and concentrate all the resources on making that message as clear as possible. For me, the most interesting insight from this data is the movement between religious groups. If I were to add information on the general mix of religions, I'd do it on the side. Lisa: in choosing to represent net flow, rather than the in and out flows individually, I removed that information you're looking for. However, in terms of sheer numbers, there are many more converts to unaffiliated than there are unaffiliated converted to any faith so that's why I made that call. I found the original chart intuitively clear, but yours completely indecipherable even with the explanation. Oh well. Another vote for the original chart, although, like Jon P, softer colors would have been a better choice. I like seeing the inflows and outflows separately. Has anyone the underlying data at hand? It would be a waste of time to repeatedly reverse engineer the data from the report. I would suggest fluctuation diagrams to summarize the migrations. hmm, derek is right there is at least a connection between "Black Protestant" to "None" missing. One reason more to look at the data! How I would do this would be to have two panels: (a) looks at the distribution of adult faiths conditional on childhood faiths (e.g. of those that start off Catholic, where do they end up? ); (b) looks at the other distribution (e.g. those that end up Catholic, where did they start?). Panel (a) would have the left column marked "childhood" with one name of a religion per row. The right column ("adulthood") would have a horizontal bar per row cut into the different end religions, marked with colours and the initial (N, C, E, etc) to help the eye. Panel (b) would be similar. To me, this would be easier to grasp than the original and would convey more information about movement between specific sects than Kaiser's version. Martin: about half of the data are in text on the internet monk blog Kaiser links to. I don't really understand the difference between all these different sects and the original report uses different terms, so I gave up trying to get the remaining raw numbers. * what percentage of the original population for each religion "peeled away"
I agree blue seems to be missing a departing chunk, but that's not a failing of the chart's design. I actually think it's a fantastic chart, and I too have no clue what your chart is trying to say, viz: "My philosophy has always been that one should not attempt to load up charts with data but rather figure out what the data is saying"
The first chart speaks clearly to me (no offense - just feedback, and I suspect - as with many of the posts I've read - that the "success" of a particular chart design must inherently depend on understanding the intended audience. In other words - what works for me might not work for you and that doesn't necessarily mean either design is bad). (click the graphic to fully appreciate the depth, but I post the landing page because it includes information relevant to the chart, which should probably have been printed on the bottom of the chart itself). I love it, but I why are some of the hairs curved and others straight?